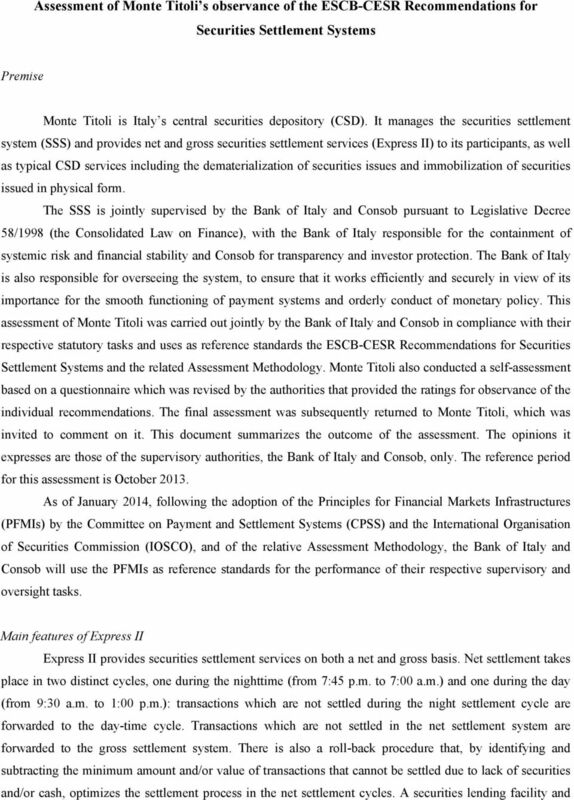 Download "Assessment of Monte Titoli s observance of the ESCB-CESR Recommendations for Securities Settlement Systems"
2 access to central bank credit facilities pursue the same objective. The gross settlement service runs during the day from 7:00 a.m. to 6:00 p.m.; the settlement of transactions stemming from the day-time net settlement cycle takes place until 4:00 p.m. Settlement services have recently been made more efficient by the launch of new functionalities aimed at strengthening early matching: the unilateral suspension of transactions until a specific release instruction, in the event of temporary unavailability of securities or funds (the hold and release functionality); the bilateral cancellation of matched but not final transactions; and second-layer matching that reaches trading members. 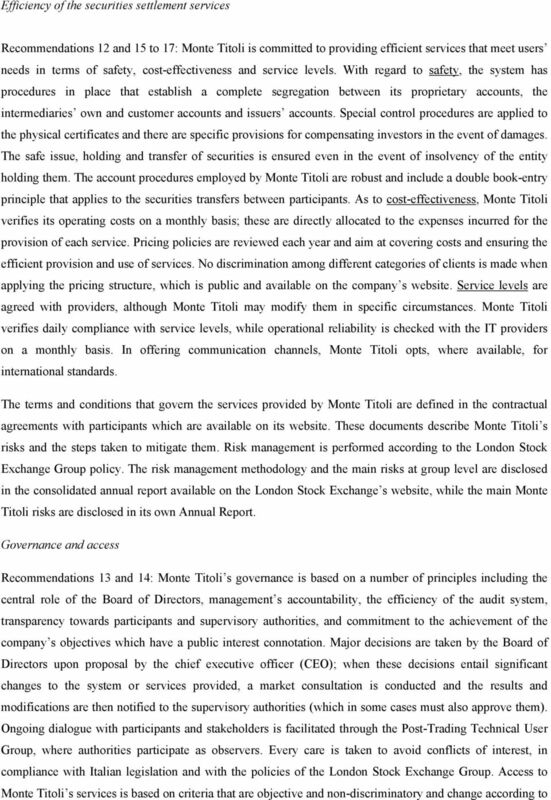 Monte Titoli is part of the London Stock Exchange Group (LSEG); this is reflected in its risk management policy as well as its governance structure. 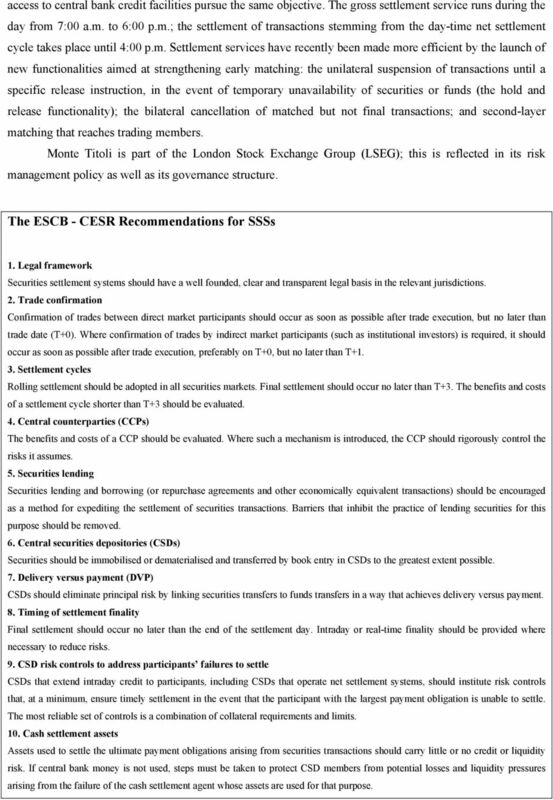 The ESCB - CESR Recommendations for SSSs 1. Legal framework Securities settlement systems should have a well founded, clear and transparent legal basis in the relevant jurisdictions. 2. Trade confirmation Confirmation of trades between direct market participants should occur as soon as possible after trade execution, but no later than trade date (T+0). Where confirmation of trades by indirect market participants (such as institutional investors) is required, it should occur as soon as possible after trade execution, preferably on T+0, but no later than T Settlement cycles Rolling settlement should be adopted in all securities markets. Final settlement should occur no later than T+3. The benefits and costs of a settlement cycle shorter than T+3 should be evaluated. 4. Central counterparties (CCPs) The benefits and costs of a CCP should be evaluated. Where such a mechanism is introduced, the CCP should rigorously control the risks it assumes. 5. Securities lending Securities lending and borrowing (or repurchase agreements and other economically equivalent transactions) should be encouraged as a method for expediting the settlement of securities transactions. Barriers that inhibit the practice of lending securities for this purpose should be removed. 6. Central securities depositories (CSDs) Securities should be immobilised or dematerialised and transferred by book entry in CSDs to the greatest extent possible. 7. Delivery versus payment (DVP) CSDs should eliminate principal risk by linking securities transfers to funds transfers in a way that achieves delivery versus payment. 8. Timing of settlement finality Final settlement should occur no later than the end of the settlement day. Intraday or real-time finality should be provided where necessary to reduce risks. 9. CSD risk controls to address participants failures to settle CSDs that extend intraday credit to participants, including CSDs that operate net settlement systems, should institute risk controls that, at a minimum, ensure timely settlement in the event that the participant with the largest payment obligation is unable to settle. The most reliable set of controls is a combination of collateral requirements and limits. 10. Cash settlement assets Assets used to settle the ultimate payment obligations arising from securities transactions should carry little or no credit or liquidity risk. If central bank money is not used, steps must be taken to protect CSD members from potential losses and liquidity pressures arising from the failure of the cash settlement agent whose assets are used for that purpose. 3 11. Operational reliability Sources of operational risk arising in the clearing and settlement process should be identified and minimised through the development of appropriate systems, controls and procedures. Systems should be reliable and secure, and have adequate, scalable capacity. Contingency plans and backup facilities should be established to allow for timely recovery of operations and completion of the settlement process. 12. Protection of customers securities Entities holding securities in custody should employ accounting practices and safekeeping procedures that fully protect customers securities. It is essential that customers securities be protected against the claims of a custodian's creditors. 13. Governance Governance arrangements for CSDs and CCPs should be designed to fulfil public interest requirements and to promote the objectives of owners and users. 14. Access CSDs and CCPs should have objective and publicly disclosed criteria for participation that permit fair and open access. 15. Efficiency While maintaining safe and secure operations, securities settlement systems should be cost-effective in meeting the requirements of users. 16. Communication procedures and standards Securities settlement systems should use or accommodate the relevant international communication procedures and standards in order to facilitate efficient settlement of cross-border transactions. 17. Transparency CSDs and CCPs should provide market participants with sufficient information for them to identify and evaluate accurately the risks and costs associated with using the CSD or CCP services. 18. Regulation and oversight Securities settlement systems should be subject to transparent and effective regulation and oversight. Central banks and securities regulators should cooperate with each other and with other relevant authorities. 19. Risks in cross-border links CSDs that establish links to settle cross-border trades should design and operate such links to reduce effectively the risks associated with cross-border settlements. 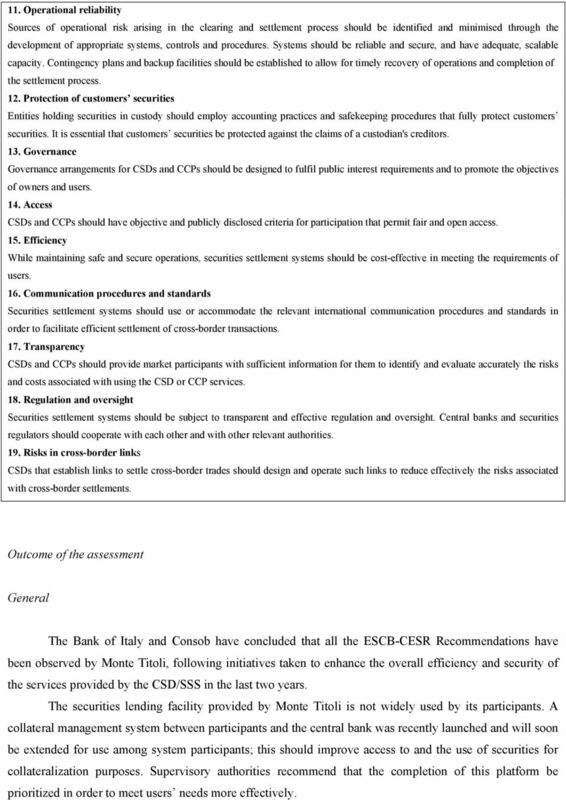 Outcome of the assessment General The Bank of Italy and Consob have concluded that all the ESCB-CESR Recommendations have been observed by Monte Titoli, following initiatives taken to enhance the overall efficiency and security of the services provided by the CSD/SSS in the last two years. 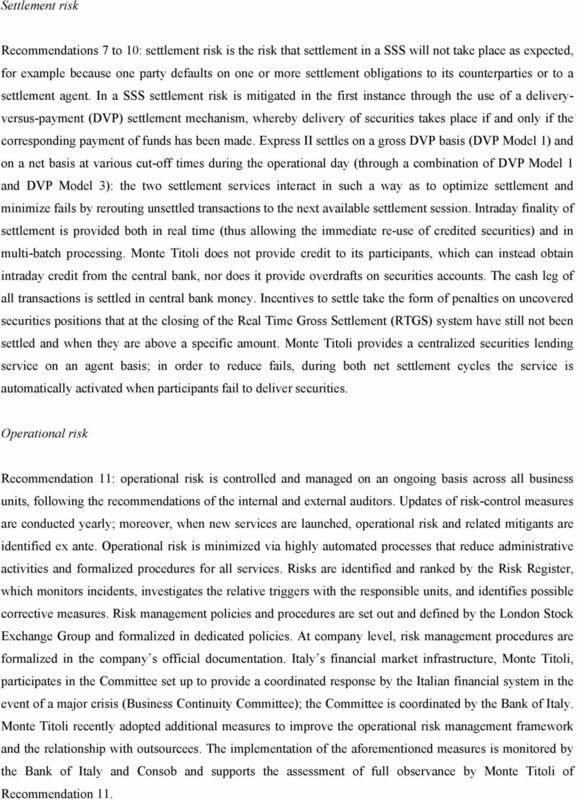 The securities lending facility provided by Monte Titoli is not widely used by its participants. A collateral management system between participants and the central bank was recently launched and will soon be extended for use among system participants; this should improve access to and the use of securities for collateralization purposes. Supervisory authorities recommend that the completion of this platform be prioritized in order to meet users needs more effectively. 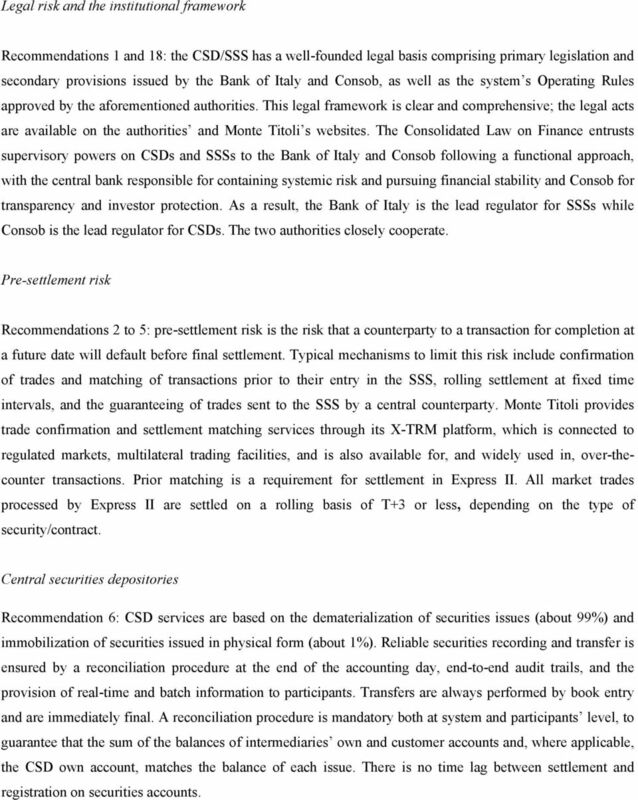 4 Legal risk and the institutional framework Recommendations 1 and 18: the CSD/SSS has a well-founded legal basis comprising primary legislation and secondary provisions issued by the Bank of Italy and Consob, as well as the system s Operating Rules approved by the aforementioned authorities. This legal framework is clear and comprehensive; the legal acts are available on the authorities and Monte Titoli s websites. The Consolidated Law on Finance entrusts supervisory powers on CSDs and SSSs to the Bank of Italy and Consob following a functional approach, with the central bank responsible for containing systemic risk and pursuing financial stability and Consob for transparency and investor protection. As a result, the Bank of Italy is the lead regulator for SSSs while Consob is the lead regulator for CSDs. The two authorities closely cooperate. Pre-settlement risk Recommendations 2 to 5: pre-settlement risk is the risk that a counterparty to a transaction for completion at a future date will default before final settlement. Typical mechanisms to limit this risk include confirmation of trades and matching of transactions prior to their entry in the SSS, rolling settlement at fixed time intervals, and the guaranteeing of trades sent to the SSS by a central counterparty. Monte Titoli provides trade confirmation and settlement matching services through its X-TRM platform, which is connected to regulated markets, multilateral trading facilities, and is also available for, and widely used in, over-thecounter transactions. Prior matching is a requirement for settlement in Express II. All market trades processed by Express II are settled on a rolling basis of T+3 or less, depending on the type of security/contract. Central securities depositories Recommendation 6: CSD services are based on the dematerialization of securities issues (about 99%) and immobilization of securities issued in physical form (about 1%). Reliable securities recording and transfer is ensured by a reconciliation procedure at the end of the accounting day, end-to-end audit trails, and the provision of real-time and batch information to participants. Transfers are always performed by book entry and are immediately final. A reconciliation procedure is mandatory both at system and participants level, to guarantee that the sum of the balances of intermediaries own and customer accounts and, where applicable, the CSD own account, matches the balance of each issue. There is no time lag between settlement and registration on securities accounts. 5 Settlement risk Recommendations 7 to 10: settlement risk is the risk that settlement in a SSS will not take place as expected, for example because one party defaults on one or more settlement obligations to its counterparties or to a settlement agent. In a SSS settlement risk is mitigated in the first instance through the use of a deliveryversus-payment (DVP) settlement mechanism, whereby delivery of securities takes place if and only if the corresponding payment of funds has been made. Express II settles on a gross DVP basis (DVP Model 1) and on a net basis at various cut-off times during the operational day (through a combination of DVP Model 1 and DVP Model 3): the two settlement services interact in such a way as to optimize settlement and minimize fails by rerouting unsettled transactions to the next available settlement session. Intraday finality of settlement is provided both in real time (thus allowing the immediate re-use of credited securities) and in multi-batch processing. Monte Titoli does not provide credit to its participants, which can instead obtain intraday credit from the central bank, nor does it provide overdrafts on securities accounts. The cash leg of all transactions is settled in central bank money. Incentives to settle take the form of penalties on uncovered securities positions that at the closing of the Real Time Gross Settlement (RTGS) system have still not been settled and when they are above a specific amount. Monte Titoli provides a centralized securities lending service on an agent basis; in order to reduce fails, during both net settlement cycles the service is automatically activated when participants fail to deliver securities. Operational risk Recommendation 11: operational risk is controlled and managed on an ongoing basis across all business units, following the recommendations of the internal and external auditors. Updates of risk-control measures are conducted yearly; moreover, when new services are launched, operational risk and related mitigants are identified ex ante. Operational risk is minimized via highly automated processes that reduce administrative activities and formalized procedures for all services. Risks are identified and ranked by the Risk Register, which monitors incidents, investigates the relative triggers with the responsible units, and identifies possible corrective measures. Risk management policies and procedures are set out and defined by the London Stock Exchange Group and formalized in dedicated policies. At company level, risk management procedures are formalized in the company s official documentation. Italy s financial market infrastructure, Monte Titoli, participates in the Committee set up to provide a coordinated response by the Italian financial system in the event of a major crisis (Business Continuity Committee); the Committee is coordinated by the Bank of Italy. Monte Titoli recently adopted additional measures to improve the operational risk management framework and the relationship with outsourcees. The implementation of the aforementioned measures is monitored by the Bank of Italy and Consob and supports the assessment of full observance by Monte Titoli of Recommendation 11. 7 the type/category of participant; access criteria are established by secondary legislation and Monte Titoli s Operating Rules and are publicly available on the company s website. Specific attention is devoted to access requests made by other financial market infrastructures (i.e. CCPs and SSSs). Monte Titoli has never refused access to a requesting entity, however, should it do so, an explicit motivation would be provided in writing. Conditions for suspension from participation as well as for terminating participation are set out in the Operating Rules and Service Manuals. 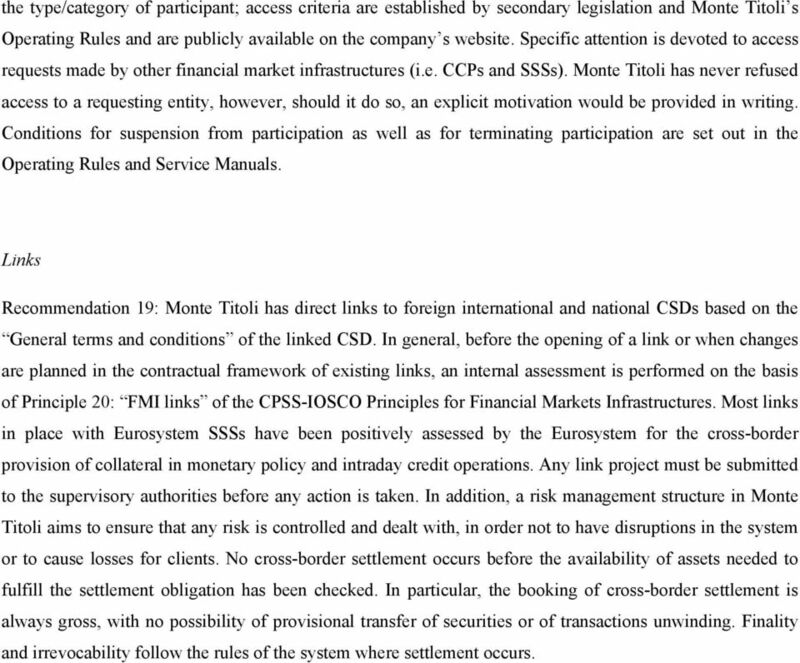 Links Recommendation 19: Monte Titoli has direct links to foreign international and national CSDs based on the General terms and conditions of the linked CSD. In general, before the opening of a link or when changes are planned in the contractual framework of existing links, an internal assessment is performed on the basis of Principle 20: FMI links of the CPSS-IOSCO Principles for Financial Markets Infrastructures. Most links in place with Eurosystem SSSs have been positively assessed by the Eurosystem for the cross-border provision of collateral in monetary policy and intraday credit operations. Any link project must be submitted to the supervisory authorities before any action is taken. In addition, a risk management structure in Monte Titoli aims to ensure that any risk is controlled and dealt with, in order not to have disruptions in the system or to cause losses for clients. No cross-border settlement occurs before the availability of assets needed to fulfill the settlement obligation has been checked. In particular, the booking of cross-border settlement is always gross, with no possibility of provisional transfer of securities or of transactions unwinding. Finality and irrevocability follow the rules of the system where settlement occurs. CLS Third Party Evaluation Guide August, 2013 An overview of the potential benefits that an institution should consider when evaluating indirect participation in the CLS settlement service. Contents 1. Assessment of the Compliance of the Fedwire Securities Service with the Recommendations for Securities Settlement Systems.